"One of the greatest feelings is when you watch an animal get past the pain and move forward." 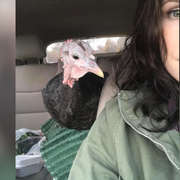 Everyone — both human and animal — was curious about a new individual who showed up at an animal sanctuary in Canada recently. 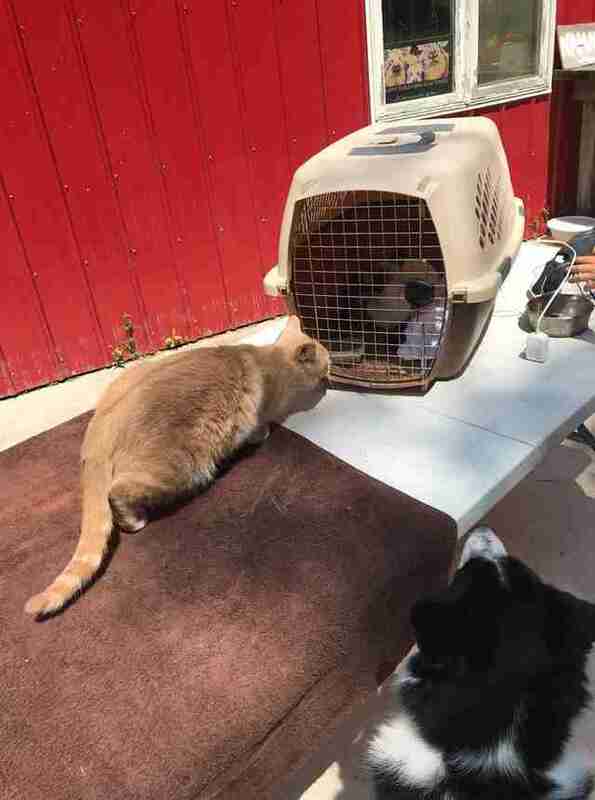 The stray Siamese cat sat in a carrier while the well-loved residents of Happy Tails Farm Sanctuary in Ontario tried to introduce themselves through the carrier's grate — but this cat was very defensive. As it would turn out, she had reason to be. "Thursday started out like any other Thursday in [animal] rescue — completely unpredictable!" Carla Reilly Moore, who founded the sanctuary with her husband, told The Dodo. 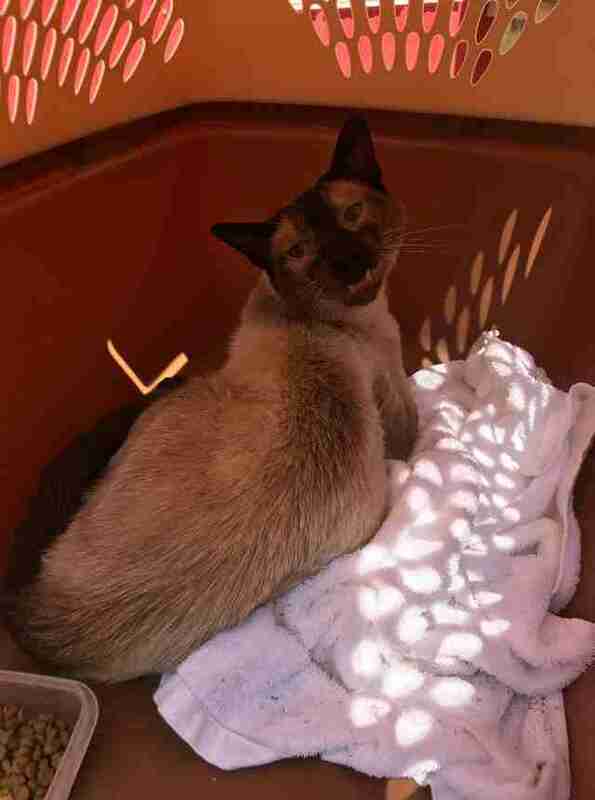 "At around 9:30 a concerned citizen who had trapped this poor skinny little Siamese cat who had been running around the small town for several months brought her in to our sanctuary to see if we could help her." 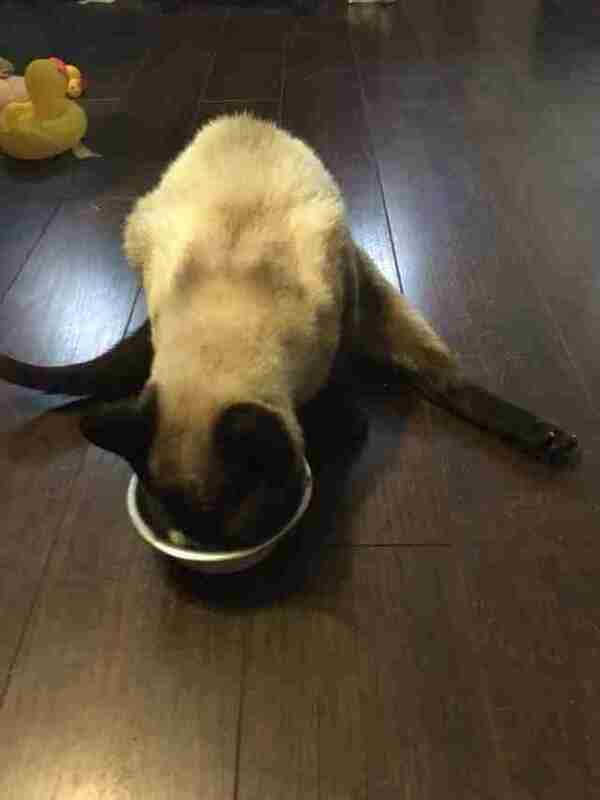 Moore could tell immediately that this cat had some problems. The cat's eyes were crusty and she seemed thoroughly exhausted. But there was something else, too. "She also had a really strange limp," Moore said. 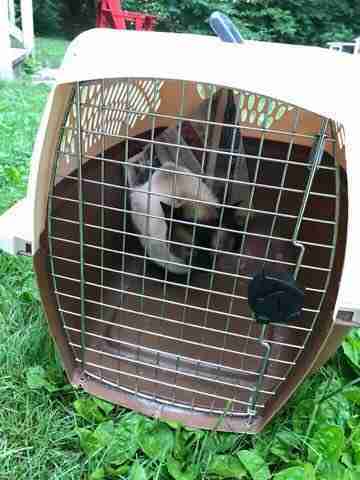 "She was very frightened, and cowered in the corner of her crate. We left her in the crate for a little bit so she could get used to the sounds and smells around her. A few of our animals went to see her." The cat didn't want to get close to anyone at all — but especially did not want anything to do with adult men. She seemed to hate it when anyone towered over her, but when Moore's husband was nearby she was even more nervous. "When she came to peek out she ran back under whenever my husband was near," Moore said. The little frightened stray had no idea just how lucky she was yet — the people at Happy Tails are used to rescuing scared animals from some of the toughest and saddest neglect and abuse cases. 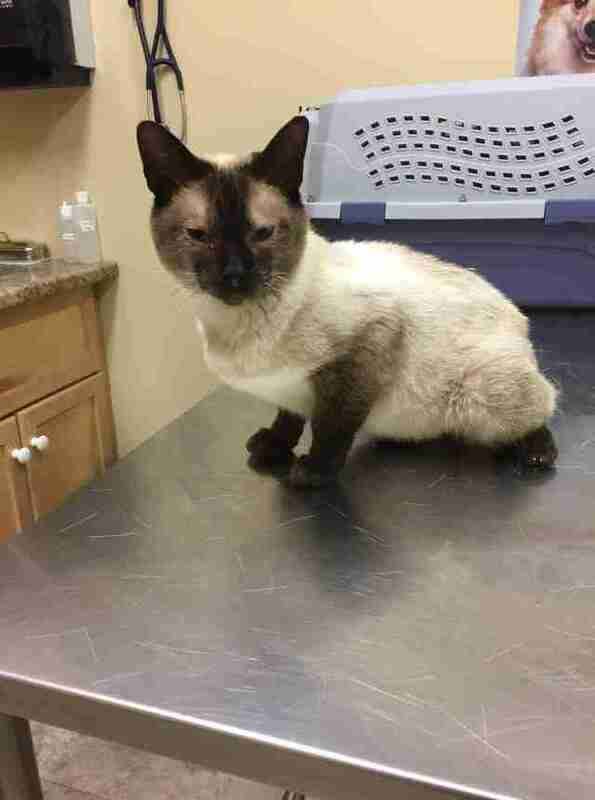 This cat was yet another animal that came to the Moore family in pain. "She could not straighten her foot very well, could not bear any weight at all," Moore said. "She held it at a very odd angle." 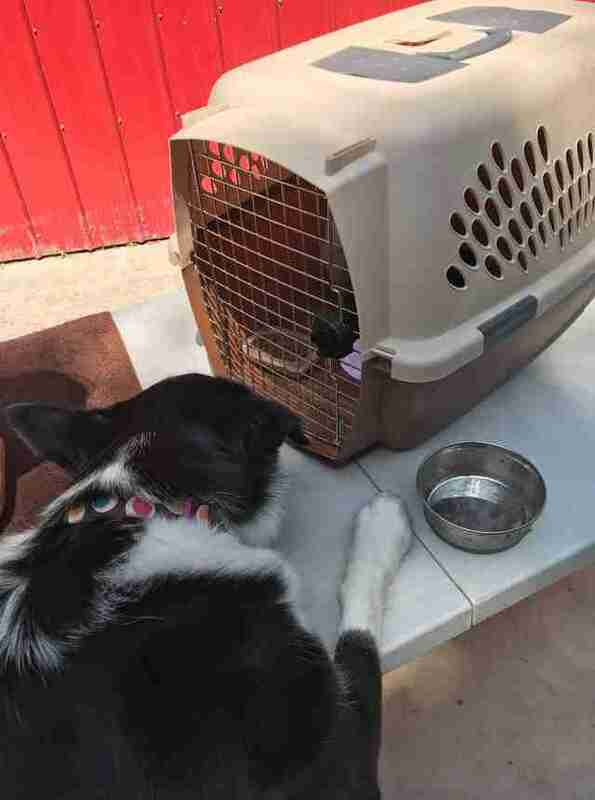 Moore and her son Theo set up the cat in a comfortable outdoor enclosure where she could rest before Moore took her to a much-needed vet appointment. "Theo absolutely loves cats," Moore said. "As soon as he found out about her he ran over to see her and sat beside her. She tentatively came out to see him. We were talking about how she was such a gem, a real jewel. That’s when Theo thought a great name would be Sapphire!" 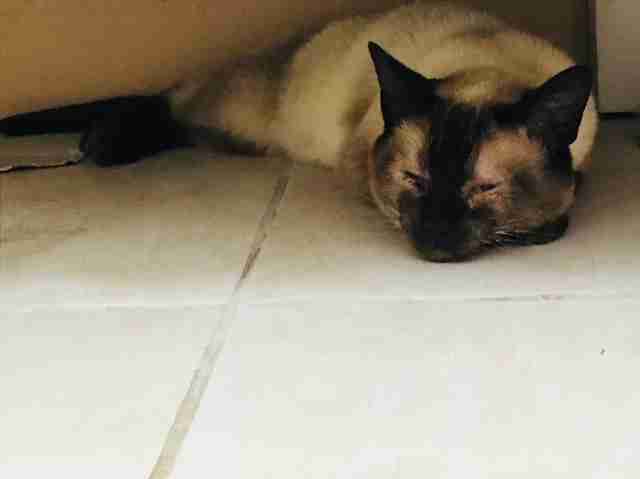 At the vet, Moore discovered that Sapphire didn't have a microchip and had probably been in a lot of pain for at least two weeks — her pelvis was broken. "It could’ve been a car, or she could’ve been kicked, we just don’t know," Moore said. But what was certain was that Sapphire had been very uncomfortable. "She’s been suffering by herself, alone in the streets for two weeks without any pain medication." The break will be tricky to treat since it's in a place that can't be healed by a cast. "Sapphire will most definitely suffer from arthritis as she ages," Moore said. When Sapphire returned from the vet, Moore decided to move her into the bedroom. "She hid under the bed a full 24 hours," Moore said. The Moore family had no idea how long Sapphire would be scared of them, especially of Moore's husband. So they resolved to go about their daily business. 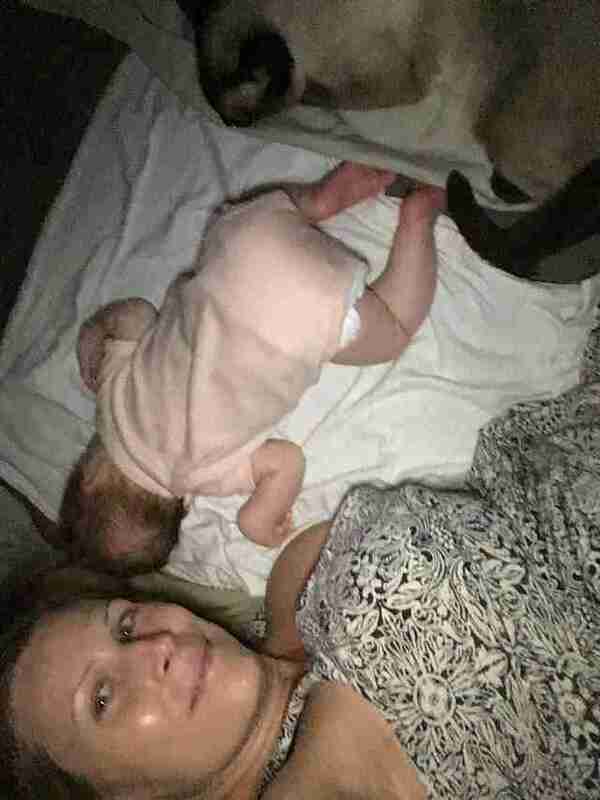 Moore just had a baby girl in May, so there was no shortage of things to do around the house with a newborn. Then, quite suddenly, after a day under the bed, there was Sapphire. She just went ahead and hopped up onto the bed and started lavishing the family with love. "We were so surprised!" Moore said. 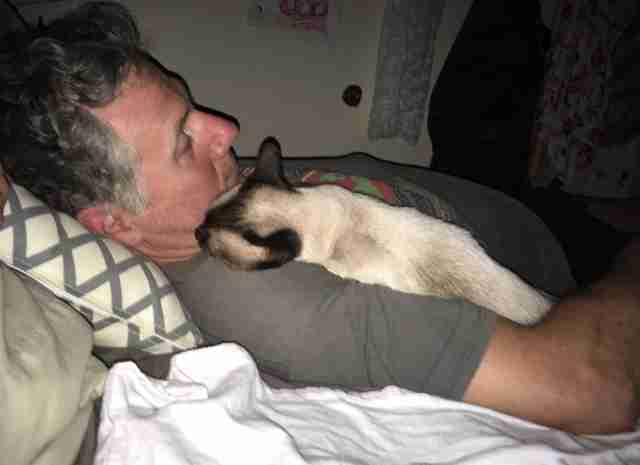 Perhaps most surprising was how Sapphire, the stray cat who was so afraid of men, went over and nuzzled into Moore's husband's neck for a long snuggle. "It was such an opposite behavior," Moore said. "We will never know what happened to her. We'll never know why she ended up on the streets, and will never know how she was injured." Moore plans to take Sapphire to a specialist to explore what to do about her injuries, which have probably given her special needs for life. 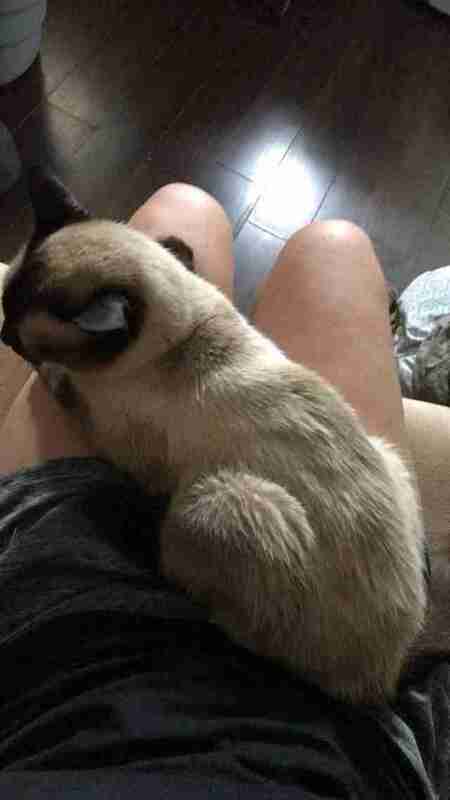 Until then, Sapphire is content with following Moore around the house and sitting in her lap whenever she takes a seat. "She follows me all over the place like a lost little puppy dog!" Moore said. 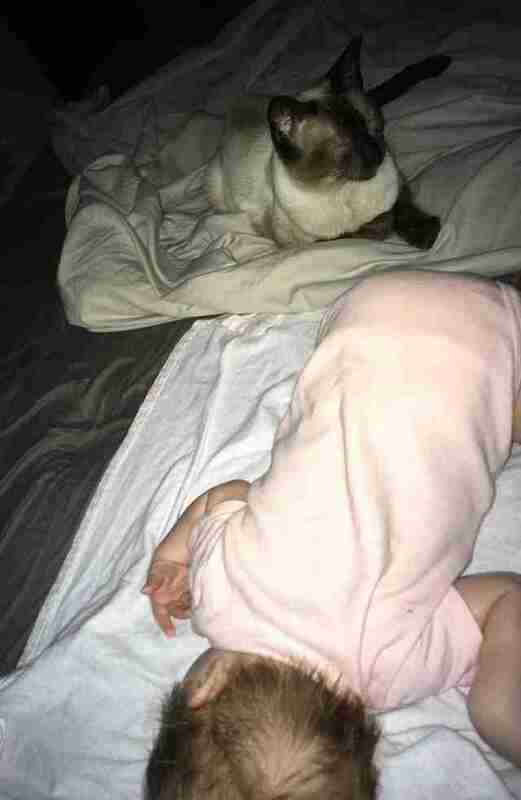 Sapphire is also pretty obsessed with Mary, the newborn baby. She's been snuggling up near her in bed whenever possible. "Running a sanctuary we see our share of animals who are broken physically and mentally," Moore said. "One of the greatest feelings is when you watch an animal get past the pain and move forward. It’s a very special moment. It’s a moment where they take a chance on the humans in their life." You can congratulate Sapphire on her new family by making a donation to her care.